CAFNEC recently kicked off the Think Outside the Bag campaign, to encourage a phase-out of plastic bags in a couple of trial areas in the far north. One of these areas is Port Douglas, where we’re excited to be working with the Douglas Shire Sustainability Group and Tangaroa Blue. Think Outside the Bag is about encouraging shoppers and businesses to shift away from a disposable bag culture and towards reusable bags. This transition makes a lot of sense both economically and environmentally, particularly as our local economy relies on nature-based tourism. Our work so far has focussed on finding creative ways to communicate our message and encourage community participation in the project. Recently in Port Douglas we ran a competition for local residents to design an image for a Port Douglas reusable shopping bag. Congratulations to competition winner, Jenni Fox, who created a beautiful underwater design. Keep an eye out for these bags which will be printed and ready to go early in the new year. Local Cairns artist Kevin Mayo has kindly helped out with the project and created an impressive window display at Community Foods cooperative in Cairns. It’s a glowing and intriguing world of plastic, so stop by the shop at 74 Shields Stand have a look if you haven’t already. As part of this project we’re also pushing for a state-wide ban on single-use disposable plastic shopping bags. You can join the growing number of people supporting this idea by signing our petition at www.cafnec.org.au. Australians use over 4 billion plastic bags each year, most of these ending up in landfill, contributing to growing waste disposal problems. But it’s not my plastic bags choking turtles! If you think it’s not your plastic bags ending up in the oceans, think again: our plastic bags can ‘escape’ from bins, waste trucks and landfill sites and end up in our rivers and oceans via stormwater drains. So each plastic shopping bag that we use might just end up in a sea turtle’s stomach. Confused by ‘degradable’ versus ‘biodegradable’? ‘Biodegradable’ bags are not made of petrochemicals, but are instead made of plant starch, often corn. These bags biodegrade, meaning that they break down into natural elements like carbon and water. They can still pose a threat to marine life if they end up in the sea, but are a better option than regular plastic bags. Where do plastic bags go for recycling? You can take your plastic bags to major supermarkets for recycling. From there they are transported to Brisbane, then overseas (usually to China) for recycling into low grade plastic items. Recycling your plastic bags is better than putting them in the bin, but beware: the process is not as environmentally friendly as you might think — it involves a lot of energy, emissions, heat, and chemicals, and the end product is always of poorer quality than the original material. The best choice is to take your own reusable bag when you go shopping. Using a reusable bag of any description is environmentally better than using disposable plastic bags. Natural fibre reusable bags (such as cotton or bamboo) are the best option. 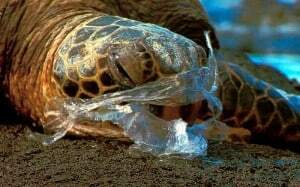 Sign our petition to make Queensland plastic bag free! South Australia, the Northern Territory and the ACT have already banned single use disposable plastic shopping bags and we can too.